As with other effective military maneuvers, civilians have repeatedly throughout history mimicked their attributes in the political realm. One such gambit has recently been launched in the new 116th Congress and we soldiers who fight on behalf of liberty and the Constitution had better take note, lest we risk being butchered in the middle. On January 3, House Member Steve Cohen (D-TN) introduced a Resolution to amend the Constitution and abolish the Electoral College. Having been stung twice in less than 20 years in Presidential elections by winning the popular vote but not the office itself, Democrats now want to tear down the system that has preserved and stabilized us for over 200 years. This even though historically Democrats have had their candidates benefit from the system including the likes of John F. Kennedy, Bill Clinton, and Franklin Delano Roosevelt. But if you think we can just throw caution to the wind and confront them on this issue, let me direct your attention to our other side where up along the ridge rides Rep. John Yarmuth (D-KY), Chairman of the House Budget Committee who has just asked the CBO to analyze the effects of shifting all healthcare costs to the federal government. Single payer healthcare, AKA socialized medicine, is on the menu for the new Congress. If either of these two attacks on traditional American process and individual liberty are successful, then we are finished as a Republic. If both are successful, then we will have completed a union between mob rule and mob entitlement. We will move into a world where post-apocalyptic films will be seen as comic relief. 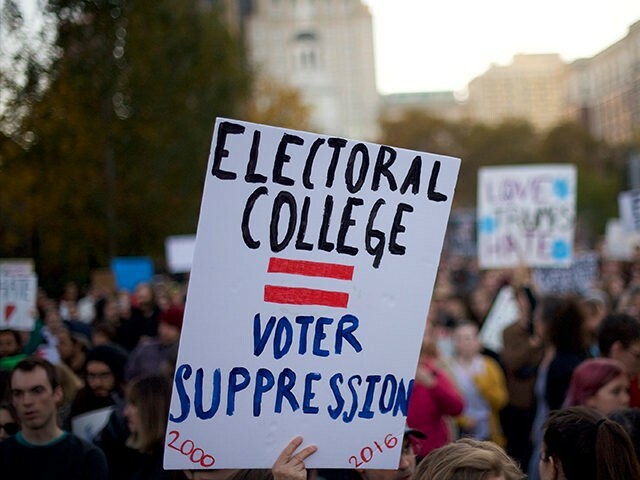 The Electoral College evolved out of the Constitutional process as the natural extension of what was called the Connecticut Compromise. That deal solved the dispute between large states that wanted representation based only on population, and smaller states that asked why sign on if our people cannot ever be heard? The Compromise created the House of Representative (each state getting members based on population) and the Senate (each state getting two regardless of population). The formation of the Electoral College brought the same sort of stability to the electing of a Chief Executive. One of its minor accomplishments over a couple of centuries was that of making possible the election of Abraham Lincoln. As is the case with anything designed by men it may be imperfect and it may not always leave you feeling you’ve been given the best result, but it has contributed to us being the greatest nation on earth for two centuries. Which is a perfect segue to the healthcare system and the attempt to take it over by government. So much of this battle was fought during the Obama Administration that it feels old and tired. With the 2017 repeal of the Obamacare mandate it might seem to many that progressives blissfully dreaming of national healthcare have already been shocked into lucidness by a loud noise named Trump. But it isn’t over. These people have us right where they always wanted us. They knew that the half-medicated solution of Obamacare would ultimately fail and then they would be far enough along to propose single payer as the only plausible next step. After all, who wants those evil insurance companies back in running the game? Why it is so important to watch what is happening around us? It is so we don’t allow ourselves to be tunnel-blinded by the adrenalin rush of fighting team left over Mueller investigations, government shutdowns, and just plain engaging in the daily back and forth of social media rage and dueling cable news pundits. While we charge to the middle of the battlefield, swords drawn, the bad guys, the ones who don’t believe in America as designed, are methodically encircling us. By 2020 the Democrats will be ready to present their death-to-America platform to voters in order to get explicit approval to move forward on both initiatives. To abolish the Electoral College, they need only a two-thirds vote in the House and Senate to then pass it on to the states for ratification. With Democrats gaining in state governorships it is not unrealistic to think they could succeed. To cross the single payer finish line, they need even less; the Senate and the White House. The Executive power will be derived from a very compound source…The votes allotted to them [States] are in a compound ratio, which considers them partly as distinct and coequal societies, partly as unequal members of the same society…From this aspect of the government it appears to be of a mixed character, presuming at least as many Federal and national features. It was a simple design to attempt to control the complex nature of man. Regarding the healthcare matter, I simply ask you this question in the spirit of Milton Friedman and Ronald Reagan: Have you ever seen government take over anything and cause it to become more effective and less costly? If we permit our nation to be ruled by a mob, and if we permit the mob to take over that portion of our economy that we use to keep ourselves alive, well, do I need to finish asking the question? Charlie Kirk is the founder and president of Turning Point USA.